Posting interest for season 5. Will have a character up this weekend. Trait: I am haunted by memories of the glade fire. I will never get those images of violence out of my head. Ideal: In life, as in war, the strongest survive. I have learned that lesson the hard way and have vowed never to be the weaker again. Description/Personality: Mialee stands over five feet tall and is lithe and fair-skinned. Her blonde hair flows just below her shoulders and is usually laced with vines and flowers. She carries a curved sword on her back, but not much more in the way of provisions, hunting or foraging as the need arrives. She is pretty by human standards with violet eyes and an easy smile, but her mood can quickly swing to anger if provoked. History: Mailee had been training to be a ranger for over a decade. The forest she and her master protected was small by any standard, but it was her home and she loved every inch. A druid had also come to call the small forest his home and plants and animals there flourished under his care. A band of orcs came into the forest one night. The ranger and druid knew of their coming long before they arrived, but there were many of them. Mialee's master bade that they be allowed to pass in peace, so long as they did not disturb the forest. Unfortunately, the orcs decided to set an outpost there and began cutting down trees almost immediately. The protectors of the forest along with a pack of wolves and numerous other animals set upon the orcs in the night. The battle raged for over an hour, but in the end, the orc numbers won the battle. 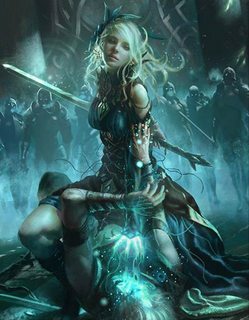 Mialee watched as her master was cut down and then she two was struck by an orc axe and the world became dark. A woman appeared before her. She appeared to be an elf, but Mialee knew her to be a fey: Titania. The fey's presence was both terrifying and beautiful, but the elf knew her to be an ally. Titania offered to grant her the ability to protect the forest and those that would threaten its children in a way that she had never known, so long as she gave her life to her. Mialee agreed without hesitation. She woke on a ridge overlooking the forest, or what was left of it. The orcs had burnt much of it to the ground. She set out from there to become the justice of the fey. Last edited by Silent Rain; 04-13-2019 at 06:31 PM. Hey! Can I apply for season 5? Here's my bard application for Season 5. All set! Would it be OK to swap the rapier starting item and proficiency that bards get with a scimitar? To give a bit more of that Bedine flavour. Personality Traits: I know a story relevant to almost every situation. I have a strong code of honor or sense of propriety that others don't understand. Ideals: When I perform, I make the world better than it was. Everything is new, but I have a thirst to learn. Bonds: My music and song is my connection to the way of life and tribe I was forced to leave behind, I hope to see them again some day. It is also my connection to present and future, providing opportunity for new experience and knowledge. Flaw: I am secretly convinced of the superiority of my own culture over this foreign land. Description: A slender man with bronzed, sun-leathered skin stands before you. His brown eyes are alight and lively, expressing great interest in the details of his surrounding, but also warmly inviting contact and interaction. His fine features - including a narrow jaw, thin lips, and slightly peaked ears - are somewhat obscured by his wiry, black beard and the patterned scarf wrapped casually, but deliberately, around his head. While not particularly muscular, he stands with a confident posture and moves with ease and grace. Under a colored and patterned robe of light fabric he wears a set of weathered, leather armors. Slung over his shoulder via a leather strap is a simple frame drum, consisting of a wooden hoop about a cubit in diameter with a mottled animal skin forming the head on one side, and the having a crossbar of wood for a grip on the other. A simple flute carved from a small, curved goat horn hangs from his neck by a loop of twine. He speaks with a strong Bedine accent and the timbre of his voice, whether spoken or sung, is a rich and buttery-smooth baritone that seems to originate from deep within his chest. Darab’at is highly curious, good-humoured, and kind. While quite disciplined, he does have the ability to occasionally relax, and even laze, when in the right environ. He is typically more inclined to handle stressful or awkward personal interactions with a lean toward compassion and mutual understanding instead of becoming angered or frustrated. He possesses a strong ethic and sense of honor, typical of the Bedine people, and sometimes has to make an effort to not to be too judgey of others. He is straightforward and honest, and stands firmly against lying, cheating, and stealing. He does not consume intoxicants. Coming from a background in which scant resources are shared, he is especially turned off by greed. Born to one of the remaining nomadic Bedine tribes, Darab’at considers the harsh Anauroch Desert his home. His human father, Achamet, became enamored with a stranded elvish traveler, Lehradeth, which he had rescued from the wastes. The love was requited and the unorthodox union was hesitantly consented by the tribe, the acceptance certainly fostered by the fact that Achamet’s brother was the tribe’s sheik. Despite the whispers amongst some of the tribe about his mother, their son, Darab’at, was embraced whole-heartedly by his people. Growing up, Darab’at did not take well to the fighting and hunting lessons most of the males of the tribe received. He persevered however, making up for a lack of strength and fighting spirit with agility of both body and mind. Darab’at DID take well to the teachings of ceremony, art, and tribal wisdom of his Bedine people. He was enthralled with learning the history of their people, their desert, and their understanding of the rest of the world through song and poem. When he was able to recite the poems of his people, he learned to accompany his lyrics with music played from pipe, drum, and rebaba. Eventually Darab’ats mother began to teach him, in private due to the tribe’s arcanophobic stance, to weave some minor magics into his lyrics and music. He made good progress, and the necessity to keep the learnings secret forged a strong bond between he and his mother. In his fifteenth year everything changed. A jealous tribemate discovered their secret lessons, and outed the revelation to the tribe. His mother, Lehradeth, was accused of being a witch and much of the tribe called for her death. Darab’at’s father’s relation to the sheik worked in Lehradeths favor, and she and her son were sentenced to exile instead of execution. The Sword of Anauroch proved to be a harsher judge, and Lehradeth perished in the wastes attempting to get her son to safety. Darab’at survived the ordeal, being “rescued” by a Zhentarim caravan. The Zhens proved to be cruel hosts, treating him as slave and servant over the weeks spent under their caravan. Darab’at managed to slip out while overnighting at an oasis, joining up with a group of merchants heading to the Sword Coast. This fortunate twist of fate was defining for Darab’at, as it was the beginning of five years of travel meandering west all the way to the Sea of Swords and Baldur’s Gate, then north by land and sea to Waterdeep. He learned how to captivate a crowd with music and poetry, earning his keep amongst the caravan he joined by lifting spirits, sharing the knowledge and rumors and gained upon the way, and occasionally washing the cookpots. Darab’at misses his homeland and his tribe deeply, and struggles with understanding exactly why it ended up as it did. But the taste of travel and new experience has woken a deeper hunger. He longs for adventure… to see what mystery lies down overgrown path from the main road; to hear the tales and learn the hopes, loves, and fears of the folk in the next village; to uncover the delightfully complicated history of the lands he wanders… and to share and sing about it all. Perhaps once he has seen, and heard, and learned enough he can bring it back to his Bedine tribe as an epic song, and they will take him back. Last edited by Simandl; Yesterday at 02:40 PM. Ok, all done and ready to go, I think! Character name: Babbling Brook "Brook"
- I'm always picking things up, fiddling with them, and sometimes accidentally breaking them. - Far more comfortable around animals than people. Ideal: Life is like the seasons, in constant change and we must change with it. Bond: I am loyal those who teach me things. Flaw: I have no sense of sarcasm, and take directions literally. Appearance: This is a rather small, lean figure, even despite the bulk of being covered in black feathers with an iridescent hue over her full body. Eyes are dark like beads positioned on either side of a blunt, straight, grey beak. The bird-creature stands bi-pedal, and rather than having a full set of wings, her feathers end at the elbow leading into taloned, spindly fingers. Her dress is simple leather armor, with a hooded cape of moss color. For all intents and purposes, she appears as a somewhat small, standing at just over five feet, humanoid corvid. Personality: Brook can be skittish, not trusting of most humanoids, although the smaller races are more palatable than larger ones. When someone towers over her in size or mass her instinct is to feel threatened. However, she is curious and does not like being alone and so she is always looking for a master or group to follow for instruction. When there are no humanoids to follow, she has learned from animals and beasts and will emulate their survival tactics. Her body posture if often fidgety, looking around, not standing still, or playing with the little collection of stones that she keeps in her pockets. She has an affinity towards new or eye-catching objects; shiny things or notable objects that stand out from their surroundings will tend to attract her curiosity. Her interest is in learning about these things, not in keeping them however; she enjoys the hunt more than the prize. History: Born into a small flock, Brook and her family were travelers, never staying put in one place as they ran tasks, often in the form of being message deliverers between shady factions. On one of these occasions, traveling through a thick wood, she slipped down a ravine, injuring a leg. Unable to climb back to the others, and the flock unable to cleverly figure out a way of rescue, she was left behind. Her injury kept her from going too far, and so she found a place near a stream where she could at least find water and began to watch other creatures and how they gathered and foraged for food, copying their tactics. After several days on her own, she was found by a Halfling woman, a hermit who had a cabin not far from there. The Halfling healed the bird's injury, and then tried to shoo the intruder away, however the Kenku kept following. Eventually, the Halfling got used to her presence, especially since the bird didn't speak and only emulated the noises of the forest, her favorite seeming to be the noise of the stream, to which she was named after, becoming Babbling Brook. The woman taught Brook many secrets of the forest and about nature's magic. She was taught that they were not just the protectors of nature, but part of it. While the Halfling woman always stayed behind, she would send Brook on tasks, sometimes these would be selling wares, or purchasing supplies or just to wander near the town to listen for gossip or news that could be reported back. After returning from one of these trips however, Brook found her master dead in her home, slain by invaders, the small already ramshackle hut where they lived torn asunder, looted of any meager goods it had contained. Rather than remain and be alone, she strayed from the forest, becoming the extension of her home and nature by way of her voice. Last edited by Dreamer; 04-15-2019 at 09:02 PM. [...]can anyone tell me how to do that? Sorry, newbie! Thanks! For any of our other wonderful new folk to rpgx, if you've introduced yourself in the new member board there is a chance I posted a reference list on that thread. Be sure to save those threads as they are incredibly helpful. For all coding info you can refer to the Wandering Bard for tips on how to format. Please note: It does take some playing around to get use to so please dont be discouraged. Welcome to all the brave Season 5 newcomers. While I sort of miss the "Alcoholics Anonymous with an annoyingly positive group leader" vibe we started with, the party should be more well rounded and interesting this way. Let's get em! A interesting crew for sure! Haha, a fun not-too-serious campaign idea would be a bunch of barbarians doing a pub crawl down the Sword Coast. One mug of ale (at least) a every inn and tavern passed on the way.